WiFi Hotspot LED Jacket with #Trinket and @Raspberry_Pi Zero W « Adafruit Industries – Makers, hackers, artists, designers and engineers! A great wearables project by Debra, aka GeekMomProjects (twitter @GeekMomProjects)! 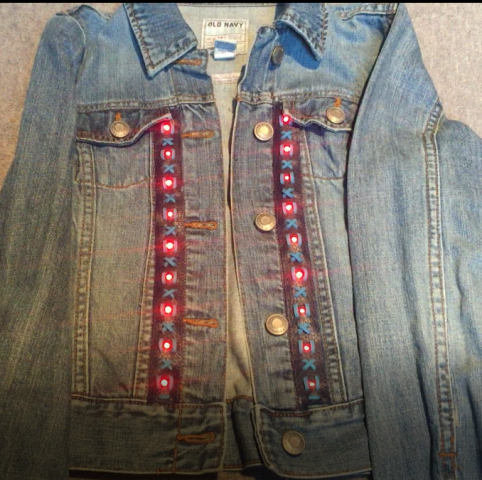 This particular jacket runs a pre-set pattern on a Trinket M0 that I programmed using a CircuitPython LED code generator. However I have made a version where the Trinket is connected via USB to a RasPi Zero W running as a wireless hotspot and since the Trinket shows up as a drive on the RasPi Zero W, you can program it wirelessly. ABove is her video of programming the LED jacket via an Apache server running on the RasPi Zero W.
She’s programmed the jacket with red, white, and blue animations for the US Fourth of July. You can see the details on the GeekMomProjects blog! What wearables project have you done recently? Let us know in the comments!